Right now, there are two ways to be safe crossing a road: Wait until no cars are close by, so there's enough time to make it to the other side of the street – or communicate with oncoming drivers. As the number of pedestrian deaths on U.S. roads climbs, up 25 percent since 2010 to more than 5,000 people in 2015, the dawn of driverless cars offers the promise of improving that sad safety record. Whether we're at a crosswalk, a traffic light or just walking out in the middle of the road, we've learned since we were young that it's important to make eye contact with the drivers of approaching cars. But that's not going to be possible with autonomous cars. Even if there's someone sitting in what would be the driver's seat, that person will be a passenger, with little – or perhaps no – control over how the car behaves. And that passenger may also be catching up on work, watching a movie or dozing off, paying no attention to what's up ahead. People and cars will need to communicate in some other way. With no universally agreed on method for doing this, my own research, and that of a number of tech companies, automobile manufacturers and startups, is exploring using different types of visual signals – akin, perhaps, to a driver waving a person across the street or flashing the car's headlights to signal their yielding the right of way. Doing that turns out to be quite complicated. Part of the problem depends on how people respond when they realize an autonomous car is approaching: Scholars at Virginia Tech Transportation Institute and the University of California at San Diego recently made news by operating vehicles on public roads with drivers carefully disguised so the cars – actually human-driven – appear to be driverless. 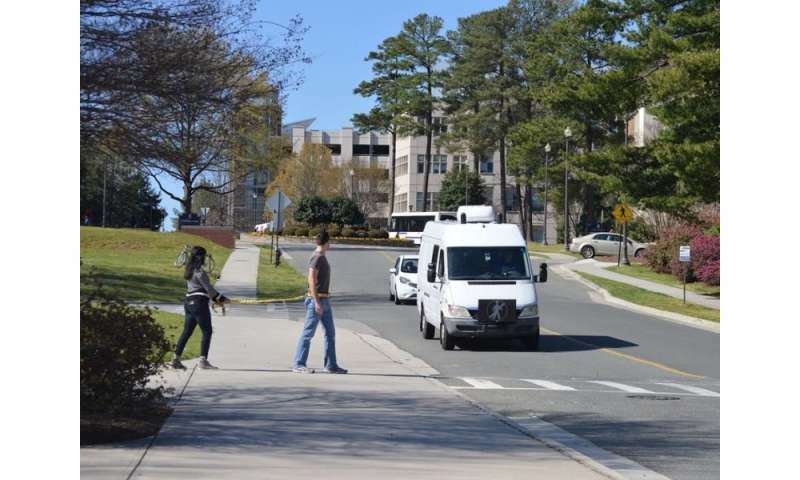 A team I'm part of at Duke University's Humans and Autonomy Lab, is also investigating how driverless cars will communicate with pedestrians. 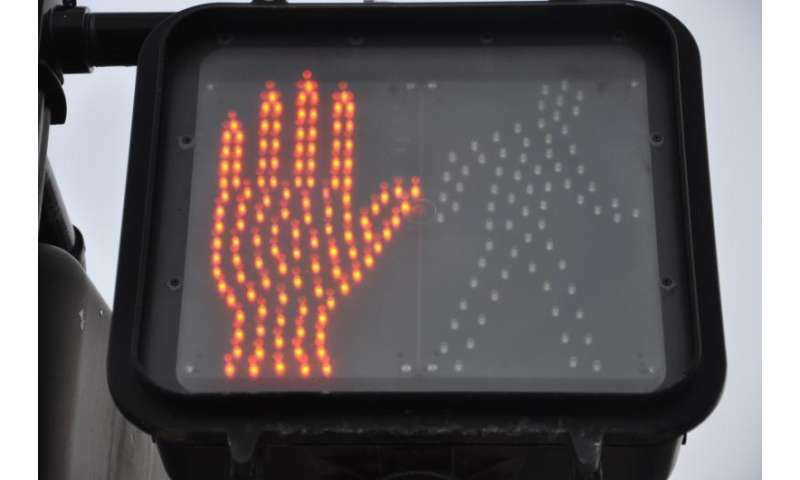 Despite federal guidelines on stationary pedestrian traffic signals in today's transportation world, there are no standards for vehicle-to-pedestrian communications at the moment. Establishing them will be important: Common crossing signals at intersections around the country make both pedestrians and drivers safer. But we don't yet know what methods are most effective. Presenting a text-based phrase like "safe to cross" may work for a single pedestrian crossing in front of a single car on a two-lane road. But there are many more complicated scenarios: When crossing a four-lane road, does "safe to cross" mean a car isn't approaching in the next lane? When multiple pedestrians are crossing from opposite sides of the street, to which of them is the car's "safe to cross" message directed? The appearance of these signs is also important. If a message like "safe to cross" is to be read clearly at 100 feet – the standard for our current stationary crossing signals – the letters will need to be at least six inches high. That would require putting them on a screen nearly four feet wide. If they're on moving vehicles, the messages would likely need to be even larger. Of course, a sign is useless if nobody looks at it. That's a concern raised by a study we completed last year, in which we compared different types of displays on the front of a van that we disguised to look as if it had no human driver. We found that only 12 percent of pedestrians used the displays to help them decide when to cross. Most people relied on their old crossing strategies, like evaluating the speed and distance of oncoming vehicles to make sure they would have time to cross. As human-driven cars become less common, labs like ours – and those in Virginia and California – will continue studying how pedestrians respond, so we can better ensure everyone's safety. Those efforts are likely to mean more people encounter a car driven by a scientist dressed as a car seat. The pedestrians should also be computer controlled.